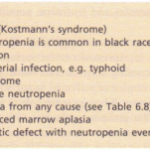 Normocytic, normochromic anaemia is seen in anaemia of chronic disease, in some endocrine disorders (e.g. 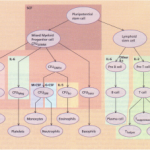 hypopituitarism, hypothyroidism and hypoadrenalism) and in some haematological disorders (e.g. aplastic anaemia and some haemolytic anaemias). In addition, this type of anaemia is seen acutely following blood loss before iron stores are depleted. 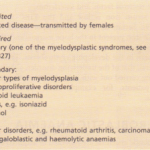 This can be divided into megaloblastic and non-megaloblastic types, depending on bone marrow findings. • Other defects of D A synthesis, e.g. congenital enzyme deficiencies in DNA synthesis such as orotic aciduria, therapy with drugs interfering with DNA synthesis and myelodysplasia. Anaemia may be present. The Mev is characteristically >96 fl unless there is a coexisting cause of microcytosis. The peripheral blood film shows macrocytes with hypersegmented polymorphs with six or more lobes in the nucleus. If severe, there may be leucopenia and thrombocytopenia. The key biochemical problem common’ to both vitamin BI2 and folate deficiency is a block in D A synthesis due to an inability to methylate deoxyuridine mono phosphate to deoxythymidine rnonophosphate, which is then used to build DNA . The methyl group is supplied by the folate coenzyme, methylene tetrahydrofolate polyglutamate. 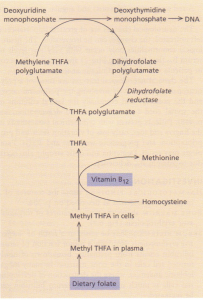 Deficiency of folate reduces the supply of this coenzyme; deficiency of vitamin B’2 also reduces its supply by slowing the demethylation of methyl tetrahydrofolate and preventing cells receiving tetrahydrofolate for synthesis of methylene tetrahydrofolate. Other congenital and acquired forms of megaloblastic anaemia are due to interference with purine or pyrimidine synthesis causing an inhibition in DNA synthesis. it suggests that BI2 is the cause of the deficiency. The addition of folate corrects the abnormality in both vitamin B’2 and folate deficiency. This is a useful method for rapidly determining the nature and severity of the vitamin deficiency in severe or complex cases of megaloblastic anaemia. Vitamin B’2 is synthesized by certain microorganisms, and humans are ultimately dependent on animal sources. It is found in meat, fish, eggs and milk, but not in plants. Vitamin B12 is not usually destroyed by cooking. The average daily diet contains 5-30 J.Lgof vitamin BI2> of which 2-3 J.Lgare absorbed. The average adult stores some 2-3 mg, mainly in the liver, and it may take 2 years or more after absorptive failure before BI2 deficiency develops, as the daily losses are small. Biochemical basis of megaloblastic anaemia. Cobalamins consist of a planar group with a central cobalt atom (corrin ring) and a nucleotide set at right angles. Vitamin B12 was first crystallized as cyanocobalamin but the main natural cobalamins have deoxyadenosyl, methyl and hydroxycobalamin groups attached to the cobalt atom. Methylcobalamin is a coenzyme for the methylation of homocysteine to methionine by methyltetrahydrofolate, as described above. Deoxyadenosylcobalamin is a coenzyme for the conversion of methylmalonyl CoA to succinyl CoA. Measurement of methylmalonic acid in urine was used as a test for vitamin B12 deficiency but it is no longer routinely carried out. Vitamin B12 is liberated from protein complexes in food by gastric enzymes and then binds to two vitamin B12- binding proteins, intrinsic factor and ‘R’ -binder. Vitamin B12 bound to ‘R’ binder is released by pancreatic enzymes and also becomes bound to intrinsic factor. The structure of methyicobalamin. the main form of vitamin B’2 in the plasma. Intrinsic factor is a glycoprotein with a molecular weight of over 44000 that is secreted by gastric parietal cells with H+ ions. It combines with vitamin B12 and carries it to specific receptors on the surface of the mucosa of the ileum. Vitamin B12 enters the ileal cells and intrinsic factor remains in the lumen. Vitamin B12 is transported from the enterocytes to the bone marrow and other tissues by the glycoprotein transcobalamin II (TC II). Although TC II is the essential carrier protein for vitamin B12, the amount of B12 on TC II is low. Vitamin B12 in plasma is mainly bound to transcobalamin I (TC I) (70- 90%) and transcobalamin III (TC III) «10%) but neither protein plays a role in delivering BI2 to the bone marrow. There are a number of causes of B12 deficiency and abnormal B12 metabolism . The commonest cause of vitamin B12 deficiency in adults is pernicious anaemia. Malabsorption of vitamin B12 due to pancreatitis, coeliac disease or treatment with metformin is mild and does not usually result in significant vitamin B12 deficiency. PAis a condition in which there is atrophy of the gastric mucosa with consequent failure of intrinsic factor production and vitamin B12 malabsorption. This disease is common in the elderly, with 1 in 8000 of the population over 60 years being affected in the UK. It can be seen in all races, but is particularly common in fair-haired and blue-eyed people. It is commoner in females than males. There is an association with other autoimmune diseases, particularly thyroid disease, Addison’s disease and vitiligo. Approximately one-half of all patients with PA have thyroid antibodies. There is a higher incidence of gastric carcinoma in males with PA than in the general population; females have a normal life expectancy with replacement therapy. Parietal cell antibodies are present in the serum in 90% of patients with PA-and also in many older patients with gastric atrophy. Conversely, intrinsic factor antibodies, although found in only 50% of patients with PA, are specific for this diagnosis. Two types of intrinsic factor antibodies are found: a blocking antibody, which inhibits binding of intrinsic factor to BI2 and a precipitating antibody which inhibits the binding of the BI2-intrinsic factor complex to its receptor site in the ileum. Their role in pathogenesis is unknown. BI2 deficiency may rarely occur in children due to a congenital deficiency or abnormality of intrinsic factor, or due to early onset of the adult autoimmune type. which supports an autoimmune basis for the disease. 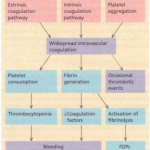 The onset of PA is insidious with progressively increasing symptoms of anaemia. Patients are sometimes said to have a lemon yellow colour due to a combination of pallor and jaundice caused by excess breakdown of Hb due to ineffective erythropoiesis in the bone marrow. A red sore tongue (glossitis) and angular stomatitis are sometimes present. The neurological changes are of greatest importance; if left untreated, the changes can be irreversible. The neurological abnormalities only occur with very low levels of serum BI2 (less than 60 ng litre-I) and occasionally occur in patients who are not clinically anaemic. The classical neurological features are those of a polyneuropathy progressively involving the peripheral nerves and the posterior and eventually the lateral columns of the spinal cord (subacute combined degeneration. Patients present with symmetrical paraesthesia in the fingers and toes, early loss of vibration sense and proprioception, and progressive weakness and ataxia. Paraplegia may result. Dementia and optic atrophy also occur due to vitamin BI2 deficiency. HAEMATOLOGICAL FINDINGS show the features of a megaloblastic anaemia as described. BONE MARROW shows the typical features of megaloblastic erythropoiesis. 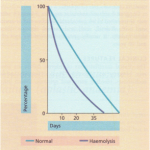 SERUM BILIRUBIN may be raised as a result of ineffective erythropoiesis. Normally a minor fraction of serum bilirubin results from premature breakdown of newly formed red cells in the bone marrow. In many megaloblastic anaemias, where the destruction of developing red cells is much increased, the serum bilirubin can be increased. SERUM VITAMIN B12 is usually well below the normal level of 160 ng litre-I. Serum vitamin BI2 can be assayed using microbiological or radioisotope dilution assays. SERUM FOLATE LEVEL is normal or high, and the red cell folate is normal or reduced due to inhibition of normal folate synthesis. The absorption of BI2 can be measured using the Schilling test (Practical box 6.2). This test may give a falsely low result if there is an incomplete 24-hour collection of urine or if renal function is impaired. An alternative to the Schilling test is whole-body counting where a radioactive dose of BI2 is given orally and the total body activity is measured. 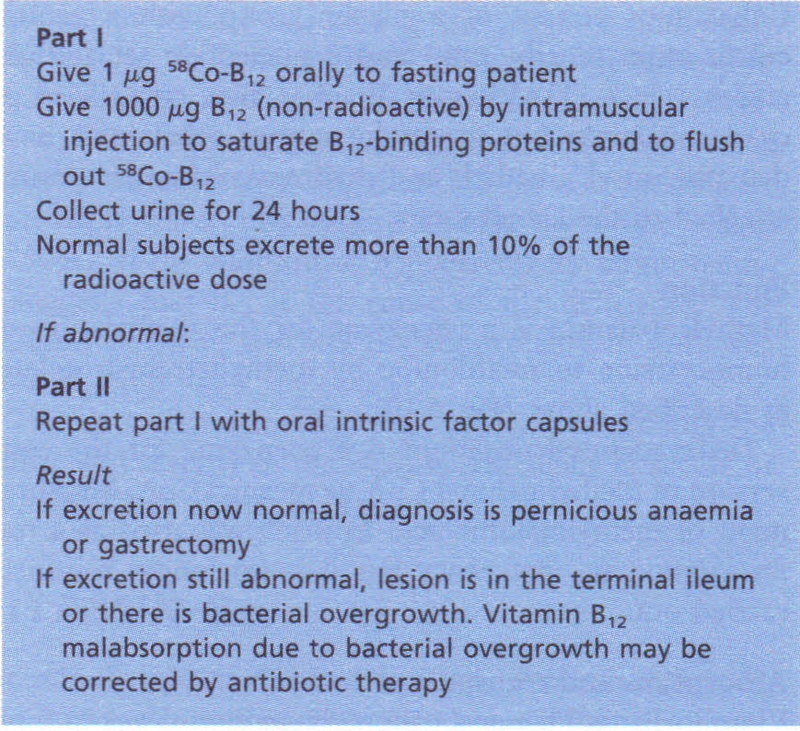 The level of radioactivity is counted no less than 7 days later to measure how much vitamin BI2 has been retained. 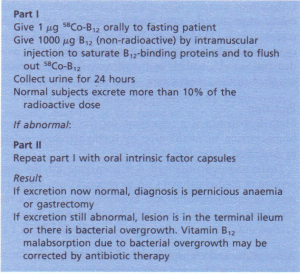 A normal result is retention of 50% or more of the 1 J.Lgdose of radioactive BI2. 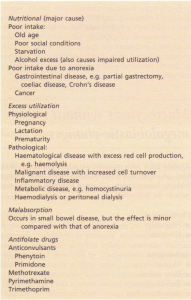 GASTROINTESTINAL DISEASE. Any disease involving the terminal ileum or bacterial overgrowth in the small bowel can produce vitamin BI2 deficiency. VEGANS. These are patients who are strict vegetarians and eat no meat or animal products. A careful dietary history should be obtained. Folic acid is formed from three building blocks: a pteridine (similar to xanthopterin), p-aminobenzoic acid and glutamic acid. It is not present in nature but is the parent compound of folates, which are polyglutamates (extra glutamic acid residues). Folates are present in food in the reduced dihydrofolate or tetrahydrofolate forms (Fig. 6.12) with methyl (CH3), formyl (CHO) or methylene (CH2) groups attached to the pteridine part of the molecule. Polyglutamates are broken down to monoglutamates in the upper gastrointestinal tract and during the absorptive process these are converted to methyltetrahydrofolate, monoglutamate which is the main form in the serum. Vitamin BI2 converts methyltetrahydrofolate to tetrahydrofolate, which is the substrate for the synthesis of folate polyglutamates in cells. These intracellular folates are the active forms of folate and act as coenzymes in the transfer of single carbon units in amino acid metabolism and DNA synthesis. Folate is found in green vegetables such as spinach and broccoli, and offal, such as liver and kidney. Cooking causes a loss of 60-90% of the folate. The minimal daily requirement is about 100 J.Lg. 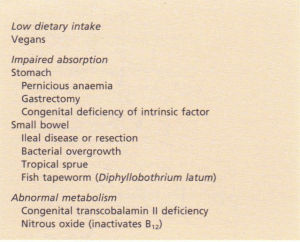 The causes of folate deficiency are shown. The structure of folic acid. Patients with folate deficiency may be asymptomatic. The clinical manifestations are megaloblastic anaemia and glossitis. The haematological findings are those of a megaloblastic anaemia as discussed. In many cases of folate deficiency the cause is not obvious from the clinical picture or dietary history. Occult gastrointestinal disease should then be suspected and appropriate investigations, such as jejunal biopsy, should be performed. the serum vitamin B12 level is known to be normal. resection, vitamin B12 should be monitored, and if low levels occur, prophylactic vitamin B12 injections should be given. This is corrected by giving 5 mg of folic acid daily; the same haeni.atological response occurs as seen after treatment of vitamin B12 deficiency. Prophylactic folate is recommended for all women planning a pregnancy, and particularly in those who have had a child with a neural tube defect. Many authorities also recommend prophylactic administration of folate throughout pregnancy but this is not essential for those women with good diets. Prophylactic folate is also given in chronic haematological disorders where there is rapid cell turnover.